I was under deadline to make these little pillows. My niece and nephew are now six and their milk teeth are bursting out of their mouths like microwaved popcorn. I was working fast and late at night, and although I wasn’t drunk, I was certainly punch drunk. Which proves that felt is very forgiving–as is the Tooth Fairy. If someone you know is losing their teeth (in the cute way, mind you), whip up this Tooth Fairy Pillow and pair with these terrific picture books: April and Esme, Tooth Fairies by Bob Graham or Throw Your Tooth on the Roof: Tooth Traditions Around the World by Selby Beeler and Brian Karas. 1. Trim two 6.5 x 4.5″ pieces of felt in contrasting colors. One piece will be the front of the pillow, the other the back. 2. Trim one 3 x 3″ piece from the third color of felt. This will become the pocket. 3. 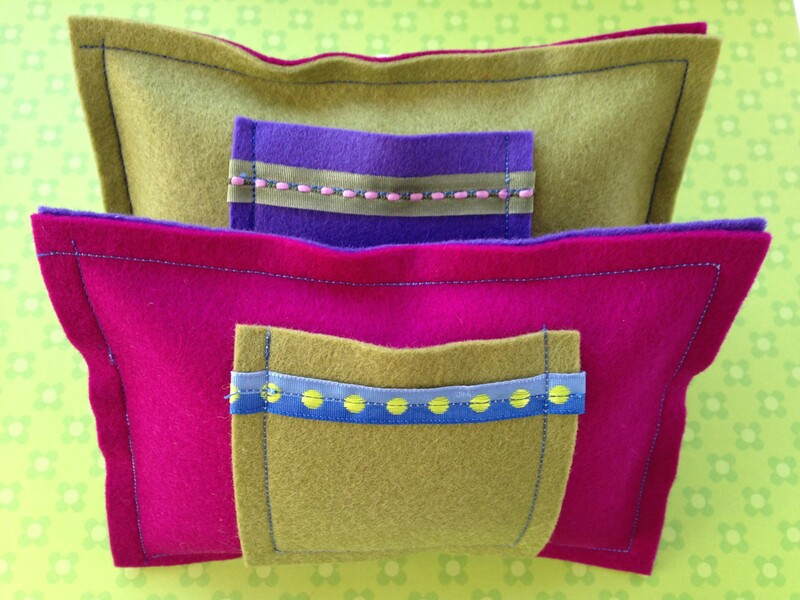 Sew the ribbon to the pocket, making sure to wrap 1/4″ of ribbon over each side to hide the ends of the ribbon. 5. Place the pillow front and the pillow back wrong sides together and machine stitch with 1/4 ” seam around the edge of the pillow leaving about a two-inch gap. 6. Stuff plumply. Machine stich the gap closed. « DIY: Quilt block block! So cute! Betty lost a tooth yesterday–it’s not quite as magical when they’re ten, but she did ask me what I did with all her teeth. I had to confess that I have a little baggie filled with teeth, to which she said “eww.” Maybe a cute little pillow or felt envelope for the tooth fairy to store her loot would also be good!